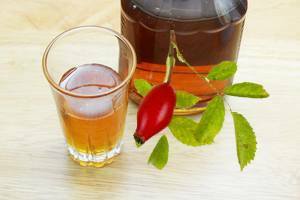 This rosehip mead recipe combines the flavour of the rosehips with that of honey and it’s a perfect match. A straightforward easy recipe. Those of us of a certain age will remember the rosehip syrup that used to be given to children. A vitamin C source after they’d been forced to swallow their cod liver oil. It was almost worth swallowing the truly awful cod liver oil for the sweet rosehip. Often rosehips can be found in wild hedgerows. Do remember when foraging not to trespass onto private land, take no more than you will use and never completely strip a plant – leave some for the birds. Avoid foraging from the side of busy roads because of pollution. Start the yeast 2 days ahead if possible. Take a sterilised jar and add a tablespoon of honey. Pour on a ¼ pint to ½ pint of boiling water and stir to mix. When cooled to 20°C or below, add the yeast and yeast nutrient. Keep covered but not airtight, a muslin cover affixed with a rubber band or string is ideal. Wash the rosehips in cold water, remove any stalks etc. Put into a large pan with 4 pints of water. Bring to a boil and simmer for 5 minutes. Mash the softened rosehips – an old fashioned potato masher is good for this or a hand blender. Put the honey into a fermenting bin or lidded wine bucket and strain the rosehip liquid through a jelly bag or muslin cloth onto it whilst still hot. Stir the honey until dissolved. Add the juice of the lemons. Allow to cool to 20°C and then add the prepared yeast starter. Ok… I believe this recipe is as close to the Alaskan Frontier Rose Hip Mead Eve Kilcher makes. I picked some Rose Hip from our field and am giving this a try. I can’t wait. I will flavor it with a fruit. I am led to believe that rosehips are best picked after the first frost. How true is this? I’ve not heard that or read anything about rosehips improving after a frost – but I could well be wrong. Hi Moira! I’ve always been told that too. Rosehips soften after the frost and it is easier to work with them, but I have got the same effect by freezing them and then defrosting (this was coincidental – I just wasn’t ready to use them straight away and froze them). If your yeast is in a small sealed sachet, use the whole sachet – otherwise about a teaspoon is plenty to get things going.